In the last few posts in this series I’ve examined some consequences of British values, where we have pounds and shillings (and also pence) – but then have this other value, the guinea, which equals one pound and one shilling. This situation, so traditional for Brits and so strange for foreigners, allowed us to imagine the same value being expressed in two different systems. In one system, values are expressed in pounds and shillings (I’m ignoring pence altogether here); in the other system, values are expressed in guineas and shillings. Each system is equally valid and workable, though one is rather familiar, and the other one is rather strange. We’ve explored writing values as vectors, and seen how the same value can be expressed as two different vectors depending on which system is used. We explored how the vector representation of a value in one system can be obtained from that in the other system through matrix multiplication, where the matrix used (the transformation matrix) is a square matrix (that is, has the same number of rows as it has columns). In the last post, we used graphs to represent values. In the first graph, there is a pound axis and a shilling axis, drawn at right angles. Values are represented by a point. In the second graph, the shilling axis is left the same, the values are all drawn in the same place as before, but values are now expressed in terms of guineas and shillings. This can be done, at the expense of showing the guinea axis not at right angles but at a different angle to the shilling axis. We saw that, though axes at right angles are convenient, there is nevertheless some arbitrariness about it. In this post, we will pursue that by drawing graphs again, but this time with the guinea axis at right angles to the shilling axis. On the guinea and shilling axes, the value of Jane’s jar is represented as shown, indicating 4 guineas and 3 shillings. As you can see, this graph can not be overlaid on top of the ones from the previous post: Jane’s jar is in a different position now. 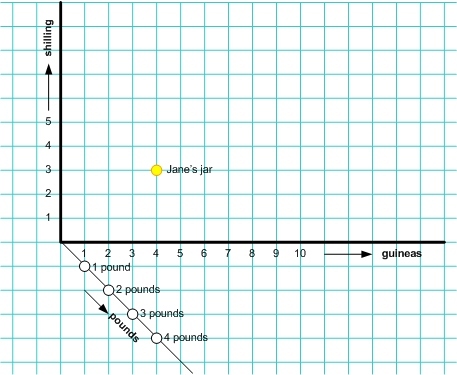 The value in Jane’s jar is still 7 shillings more than 4 pounds; this is shown in the graph by having the 4-pound mark 7 shillings below the mark for Jane’s jar. This is consistent with the notion that a pound is one guinea minus one shilling, and showing pounds below the guineas axis is a way to express their values as having a negative shilling component. We can show the same values in the same place, using shilling and pound axes, but only if we are willing to accept pounds and shilling axes to be at something other than right angles; this is shown below. 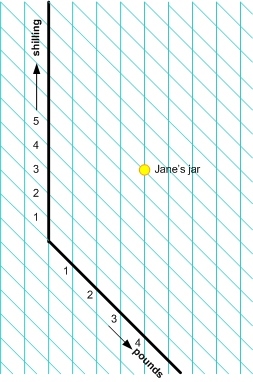 This graph, when printed on transparent paper, could be overlaid over the previous graph, and show both the shilling axis and the value in Jane’s jar in the same location. As you see, ‘guineas’ are no longer marked on it; we merely have pounds and shilling axes, just not at right angles. Even though some of the four graphs shown (two in this post, two in the prior post) look more familiar than others, you could argue that none is intrinsically ‘truer’ than the others. The coordinate grids where axes are at non-right angles will give us an interesting lead in to vector addition and linear combinations, viewed geometrically. This entry was posted in Uncategorized and tagged denominations, extending patterns, matrix multiplication, models, naming, representations, whole vs. parts. Bookmark the permalink.